Dame Joan Alston Sutherland, OM, AC, DBE (7 November 1926 – 10 October 2010) was an Australian dramatic coloratura soprano noted for her contribution to the renaissance of the bel canto repertoire from the late 1950s through to the 1980s. One of the most remarkable female opera singers of the 20th century, she was dubbed La Stupenda by a La Fenice audience in 1960 after a performance of the title role in Handel's Alcina. She possessed a voice of beauty and power, combining extraordinary agility, accurate intonation, "supremely" pinpoint staccatos, a splendid trill and a tremendous upper register, although music critics often complained about the imprecision of her diction.Her friend Luciano Pavarotti once called Sutherland the "Voice of the Century"; Montserrat Caballé described the Australian's voice as being like "heaven". Sutherland was the first Australian to win a Grammy Award, for Best Classical Performance – Vocal Soloist (with or without orchestra) in 1962. Joan Sutherland was born to Scottish parents in Sydney, Australia, and attended St Catherine's School in the suburb of Waverley, New South Wales. As a child, she listened to and imitated her mother's singing exercises. Her mother, a mezzo-soprano, had taken voice lessons but never considered making a career as a professional singer. Sutherland was 18 years old when she began seriously studying voice with John and Aida Dickens. She made her concert debut in Sydney, as Dido in Purcell's Dido and Aeneas, in 1947. In 1951, she made her stage debut in Eugene Goossens's Judith. In 1951, after winning Australia's most important competition, the Sun Aria (now known as the Sydney Eisteddfod McDonald's Operatic Aria) in 1949. In that same year, she came second after Ronal Jackson in radio's Mobil Quest, which she won a year later, in 1950. She then went to London to further her studies at the Opera School of the Royal College of Music with Clive Carey. She was engaged by the Royal Opera House, Covent Garden, as a utility soprano, and made her debut there on 28 October 1952, as the First Lady in The Magic Flute, followed in November by a few performances as Clotilde in Vincenzo Bellini's Norma, with Maria Callas as Norma. Being an admirer of Kirsten Flagstad in her early career, she trained to be a Wagnerian dramatic soprano. In December 1952, she sang her first leading role at the Royal Opera House, Amelia in Un ballo in maschera. Other roles included Agathe in Der Freischütz, the Countess in The Marriage of Figaro, Desdemona in Otello, Gilda in Rigoletto, Eva in Die Meistersinger von Nürnberg, and Pamina in The Magic Flute. In 1953, she sang the role of Lady Rich in Benjamin Britten's Gloriana a few months after its world premiere, and created the role of Jennifer in Michael Tippett's The Midsummer Marriage, on 27 January 1955. In 1957, she appeared in Handel's Alcina with the Handel Opera Society, and sang selections from Donizetti's Emilia di Liverpool in a radio broadcast, in which performances her bel canto potential was clearly demonstrated. The following year she sang Donna Anna in Don Giovanni in Vancouver. In 1958, at the Royal Opera House, after singing "Let the bright Seraphim" from Handel's oratorio Samson, she earned a ten-minute-long standing ovation. In 1959, Sutherland was invited to sing Lucia di Lammermoor at the Royal Opera House in a production conducted by Tullio Serafin and staged by Franco Zeffirelli. The role of Edgardo was sung by her fellow Australian Kenneth Neate, who had replaced the scheduled tenor at short notice. It was a breakthrough for Sutherland's career, and, upon the completion of the famous Mad Scene, she had become a star. In 1960, she recorded the album The Art of the Prima Donna, which remains today one of the most recommended opera albums ever recorded: the double LP set won the Grammy Award for Best Classical Performance – Vocal Soloist in 1962. The album, a collection consisting mainly of coloratura arias, displays her seemingly effortless coloratura ability, high notes and opulent tones, as well as her exemplary trill. The album was added to the National Film and Sound Archive's Sounds of Australia registry in 2011. By the beginning of the 1960s, Sutherland had already established a reputation as a diva with a voice out of the ordinary. She sang Lucia to great acclaim in Paris in 1960 and, in 1961, at La Scala and the Metropolitan Opera. In 1960, she sang a superb Alcina at La Fenice, Venice, where she was nicknamed La Stupenda ("The Stunning One"). Lucia di Lammermoor generated so much excitement that standees began lining up at 7:30 that morning. Her singing of the Mad Scene drew a thunderous 12-minute ovation. Sutherland would soon be praised as La Stupenda in newspapers around the world. Later that year (1960), Sutherland sang Alcina at the Dallas Opera, with which she made her US debut. Her Metropolitan Opera debut took place on 26 November 1961, when she sang Lucia. After a total of 223 performances in a number of different operas her last appearance there was a concert on 12 March 1989.During the 1978–82 period her relationship with the Met severely deteriorated when Sutherland had to decline the role of Constanze in Mozart's Die Entführung aus dem Serail, more than a year before the rehearsals were scheduled to start. The opera house management then declined to stage the operetta The Merry Widow especially for her, as requested; subsequently, she did not perform at the Met during that time at all, even though a production of Rossini's Semiramide had also been planned, but later she returned there to sing in other operas. During the 1960s, Sutherland had added the greatest heroines of bel canto ("beautiful singing") to her repertoire: Violetta in Verdi's La traviata, Amina in Bellini's La sonnambula and Elvira in Bellini's I puritani in 1960; the title role in Bellini's Beatrice di Tenda in 1961; Marguerite de Valois in Meyerbeer's Les Huguenots and the title role in Rossini's Semiramide in 1962; Norma in Bellini's Norma and Cleopatra in Handel's Giulio Cesare in 1963. In 1966 she added Marie in Donizetti's La fille du régiment, which became one of her most popular roles, because of her perfect coloratura and lively, funny interpretation. In 1965, Sutherland toured Australia with the Sutherland-Williamson Opera Company. Accompanying her was a young tenor named Luciano Pavarotti, and the tour proved to be a major milestone in Pavarotti's career. Every performance featuring Sutherland sold out. During the 1970s, Sutherland strove to improve her diction, which had often been criticised, and increase the expressiveness of her interpretations. She continued to add dramatic bel canto roles to her repertoire, such as Donizetti's Maria Stuarda and Lucrezia Borgia, as well as Massenet's extremely difficult Esclarmonde, a role that few sopranos attempt. With Pavarotti she made a very successful studio-recording of Turandot in 1972 under the baton of Zubin Mehta, though she never performed the role on stage. Sutherland's early recordings show her to be possessed of a crystal-clear voice and excellent diction. However, by the early 1970s her voice lost some of this clarity in the middle register, and she often came under fire for having unclear diction. Some have attributed this to sinus surgery; however, her major sinus surgery was done in 1959, immediately after her breakthrough Lucia at Covent Garden. In fact, her first commercial recording of the first and final scene of Lucia reveals her voice and diction to be just as clear as prior to the sinus procedure. Her husband Richard Bonynge stated in an interview that her "mushy diction" occurred while striving to achieve perfect legato. According to him, it is because she earlier had a very Germanic "un-legato" way of singing.She clearly took the criticism to heart, as, within a few years, her diction improved markedly and she continued to amaze and thrill audiences throughout the world. In the late 1970s, Sutherland's voice started to decline and her vibrato loosened to an intrusive extent. However, thanks to her vocal agility and solid technique, she continued singing the most difficult roles amazingly well. As her vocal security to some extent lessened, paradoxically her dramatic grasp of the theatrical moment heightened. During the 1980s, she added Anna Bolena, Amalia in I masnadieri, and Adriana Lecouvreur to her repertoire, and repeated Esclarmonde at the Royal Opera House performances in November and December 1983. Her last full-length dramatic performance was as Marguerite de Valois (Les Huguenots) at the Sydney Opera House in 1990, at the age of 63, where she sang Home Sweet Home for her encore.Her last public appearance, however, took place in a gala performance of Die Fledermaus on New Year's Eve, 1990, at Covent Garden, where she was accompanied by her colleagues Luciano Pavarotti and the mezzo-soprano Marilyn Horne. According to her own words, given in an interview with The Guardian newspaper in 2002, her biggest achievement was to sing the title role in Esclarmonde. She considered those performances and recordings her best. After retirement, Sutherland made relatively few public appearances, preferring a quiet life at her home in Les Avants, Switzerland. One exception was her 1994 address at a lunch organised by Australians for Constitutional Monarchy. In that address, she made remarks about having to be interviewed by a clerk of Chinese or Indian background when applying to renew her Australian passport. Her comments caused controversy. "Opera superstar Dame Joan Sutherland gives an exhaustive account of her performing and recording career over four decades. From her early years in Australia and with the Covent Garden company in London, to her daunting schedule at most of the major opera houses of the world, we read endlessly of where, when, and with whom she sang which roles. We're shown a sensible woman and a hard-working artist, with a healthy ego tempered by a sense of humor that is often self-deprecating." On 3 July 2008, she fell and broke both of her legs while gardening at her home in Switzerland.She completely recovered and attended a 2009 luncheon hosted by Queen Elizabeth at Buckingham Palace in honour of members of the Order of Merit. On 11 October 2010, Sutherland's family announced that she had died at her home at Les Avants in Switzerland the previous day of cardiopulmonary failure – "the heart just gave out...When it came to the point that she physically couldn't do anything, she didn't want to live any more. She wanted to go, she was happy to go, and in the end she died very, very peacefully." Though she recovered from her fall in 2008, it led to more serious health problems. A statement from her family said "She's had a long life and gave a lot of pleasure to a lot of people." Sutherland had requested a small, private funeral service. Her funeral was held on 14 October and Opera Australia planned a tribute to her.Artistic director of Opera Australia, Lyndon Terracini, said "We won't see her like again. She had a phenomenal range, size and quality of voice. We simply don't hear that any more. "Sutherland is survived by her husband, son, daughter-in-law and two grandchildren. 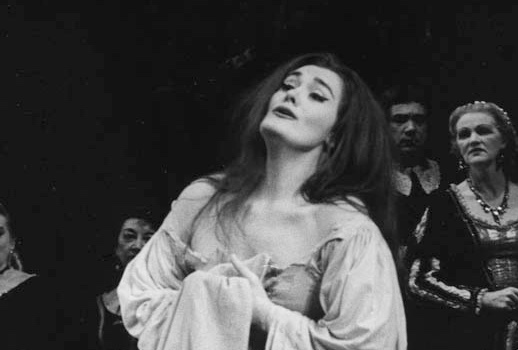 Described as "fresh," "silvery" and "bell-like" until 1963,Joan Sutherland's voice later became "golden" and "warm"; music critic John Yohalem writes it was like "molten honey caressing the line." In his book Voices, Singers and Critics, John Steane writes that "if the tonal spectrum ranges from bright to dark, Sutherland's place would be near the centre, which is no doubt another reason for her wide appeal." According to John Yohalem, "Her lower register was a cello register, Stradivarius-hued." Her voice was full and rounded even in her highest notes, which was brilliant, but sometimes "slightly acid."